I got a late start to the morning…my sleeping bag was warm…VANilla wasn’t! Petey and I spent the morning taking the historic tour around Council Grove. Council Grove played a key role in the growth of the Santa Fe Trail when a treaty signed in 1825 between the U.S. Commissioners and the Osage Indians resulted in free passage for Americans and Mexicans through Indian Territory in exchange for $800. We intended to take a walking tour, but after about five minutes in the cold, windy elements, my frozen feet turned back to VANilla for a toasty warm drive. We first stopped at the Kaw Mission State Historic Site & Museum where the curator provided me all sorts of information. 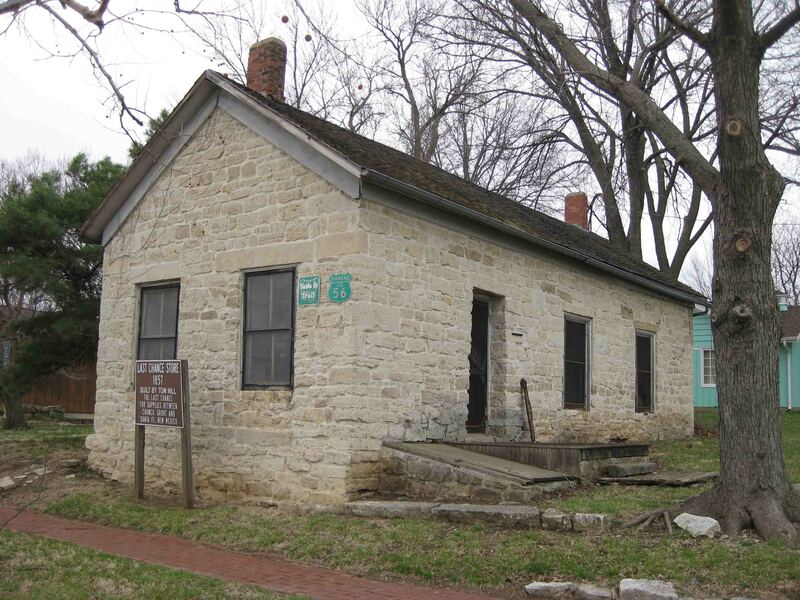 The Kaw Mission, built in 1851, was a school for boys from the Kaw or Kansa American Indian tribe from which the state of Kansas takes it name. From here, visitors may follow the riverwalk to town to visit historic buildings, but as previously mentioned Petey and I opted for a motorized transport. We passed through town to see an old bell, first erected on a wooden tower in 1866 to serve as a school and church bell as well as an alarm for Indian raids. The bell later capped the current stone monument which was constructed in 1901. Just down the street, geocachers can find a cache and historians can find the Hermit’s Cave. This cave served as shelter to a religious mystic, locally known as Father Francesco. Born in Italy in 1801, the Italian priest, Giovanni Maria de Agostini, was forced out of Italy for falling in love with a young woman. He spent a few months in this cave in 1863 before he left Council Grove in the company of a wagon train, walking over 500 miles to Las Vegas, New Mexico where he lived in a cave that became known as Hermit’s Peak. It is reported that he performed miracle cures that drew large crowds. Eventually, the citizens of Las Vegas built him a small cabin where he carved religious emblems in exchange for cornmeal. The hermit left for southern New Mexico and the Organ Mountains in 1867 and was mysteriously murdered in 1869. We also visited the Terwilliger Home which currently operates as a café and museum. The owner invited me in to look around. He said, originally the house was the last house in Council Grove that Santa Fe freighters passed as they proceeded west. Over time it was used as a service station and eventually fell into ruins until it was recently restored. One of the doorways even showcases Indian pictographs. We continued to zig-zag around town to see numerous sites. The Last Chance Store, built in 1857, as the name suggests was the last chance for journeymen to pick up supplies before heading west to Santa Fe. Its advertising slogan read, “Last Chance for Beans, Bacon, and Whiskey”. The M-K-T Depot shortened from Missouri, Kansas, and Texas Railroad Depot and also known as the Katy depot is one of only two Katy deports remaining on their original sites in Kansas. It turns out “caching” took place as early as 1825. We visited the remains of a 270 year old oak that served as an unofficial post office for travelers on the Santa Fe Trail from 1825-1847. Passing caravans left messages for future travelers in a cache at the base of a tree. Another old oak (the Council Oak) that toppled in a wind storm in 1958, is the oak under which the council was held to sign the treaty mentioned above between three U.S. Commissioners and the Osage Indians. It was at this time that Council Grove got its name. The only jail on the Santa Fe Trail, which housed many bad men and bootleggers since the 1880s, was reconstructed in 1998 and now stands at a nearby park along with the Sylvan Park Depot and other historic attractions. Our last stop in town was at the Madonna of the Trail statue erected in 1928 by the Daughters of the American Revolution. The statue depicts a pioneer woman with two children. These statues were placed in communities on the National Old Trails Road in 12 states. At the suggestion of the curator I met earlier this morning, I drove 3.5 miles southeast of town to the Allegawaho Memorial Park, owned by the Kaw Nation a self-governing tribe of 2,900 members, to walk the two mile Kanza Heritage Trail with Petey. Even with directions, it was hard to find as VANilla carried us across two different gravel roads to the remains of a Kaw Agency Building which sat a few hundred yards south of the trail. I probably wouldn’t have been so diligent to find this area except there was a cache hidden nearby, that by the time I got my GPS out on the trail, I had already passed by – bummer! The trail wound past a replica of a Kanza earth lodge which represents the traditional Kanza life style, through the Little John Creek Valley, and atop the highest point in the park which affords a lovely view of the surrounding Flint Hills. In addition, visitors can explore stone ruins of three huts built by the U.S. government for the Kanzas in 1862. The Kanzas chose not to live in them, but instead used them as stables for their horses. The park is also home to the Monument to the Unknown Kanza Warrior. The monument, erected in 1926 by local citizens, entombs the remains of a warrior found in a nearby streambed and his burial paraphernalia. Petey and I finally left Council Grove after lunch and headed west to Marion Reservoir. After an unsuccessful search for a micro cache, we continued on to Maxwell Wildlife Refuge, another place that proved difficult to find along the dirt roads of Kansas. As I drove down the road, an older, tanned couple waived me down. The gentleman, sporting a long, white beard asked if I thought the roadside fire was a controlled burn or a wildfire. While I figured it was a controlled burn, I didn’t really know and said so. “We’re from California”, called out his wife. Judging from their appearance, I’m guessing they were hiking across the USA. In hindsight, I should have asked more questions, but I was preoccupied with being lost regularly, trying to get cell reception that continuously cut off during my conversation with a friend, and seeing one of only 200 bison that wander the 2,200 acre property. Once we saw some farmers attending the fire, I moved on to an observation tower nearby and watched the bison grazing on the plains! I probably should have found a campground in this general area, but since I heard snow might be in tomorrow’s forecast, I kept going. VANilla carted Petey and me along another dusty road at Cheyenne Bottoms, sometimes called the Jewel of the Prairie. Some 41,000 acres of cattails and marshland serve as a way point for migrating birds in the spring and fall. We saw a variety of ducks, pelicans, and even two owls as the sun began to set. Pressing further southwest, we briefly stopped at the closed gates to Fort Larned National Historic Site. I presumed I’d arrived too late, but it provided a decent stop to snap a photo of the sun falling below the horizon. The neatest part of watching the sunset is that it looked like it was setting above the treed horizon, perhaps because the area is so flat. Hopefully the picture will work as an explanation as I am at a loss for words to describe it.